Quail Hill Publishing, 9780692022672, 108pp. A twist of mystery & a dash of romance in this Yuletide tale filled with surprises. Homicide Inspector Rebecca Mayfield and Richie Amalfi were introduced in the Angie Amalfi mysteries. They now have their own series. This novella shows how they met. When Santa Claus lies dead and flattened (as if he'd fallen from his sleigh) in the middle of a mall on Christmas Eve, Rebecca Mayfield is on the case. 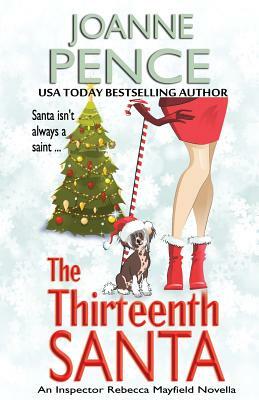 As she attempts to solve the homicide, Richie Amalfi shows up seeking help in tracking down a van full of Santas creating havoc throughout San Francisco. Rebecca is fairly certain he has information that will help her case...but she never expects he could bring her some much-needed Christmas cheer. Joanne Pence is an award-winning and USA Today best-selling author of the mysteries as well as historical fiction, contemporary romance, romantic suspense, a fantasy, and a thriller. The stories present a variety of times, places, and reading experiences from mysterious to thrilling, emotional to lightly humorous, as well as powerful tales of times long past. The Angie Amalfi mysteries have been USA Today and Independent Mystery Bookstore Association bestsellers, and the series has won the Independent Booksellers' Golden Scroll Award. SOMETHING'S COOKING, the first book in the series, was nominated for the Romance Writers of America's RITA award in romantic suspense. TOO MANY COOKS, the second book, received a Gold Certificate from RomCon and Reviewers' Choice Award from Romantic Times. COOKS OVERBOARD was a Mystery Guild featured alternate; TO CATCH A COOK was nominated for a Reviewers' Choice "Best Amateur Sleuth" award, Golden Quill Award, and Daphne Du Maurier Award; BELL, COOK, AND CANDLE and TWO COOKS A-KILLING were also nominated for "Best Amateur Sleuth" awards; and the recent books have all been Romantic Times "Top Picks." Joanne is a two-time nominee for the Romantic Times Career Achievement Award in Mystery. DANCE WITH A GUNFIGHTER was a finalist for the Willa Cather Literary Award for historical fiction, and ANCIENT ECHOES won the Top Idaho Fiction Book Award for 2013. Many of the novels have been on Amazon Kindle Top-100 best-seller lists.